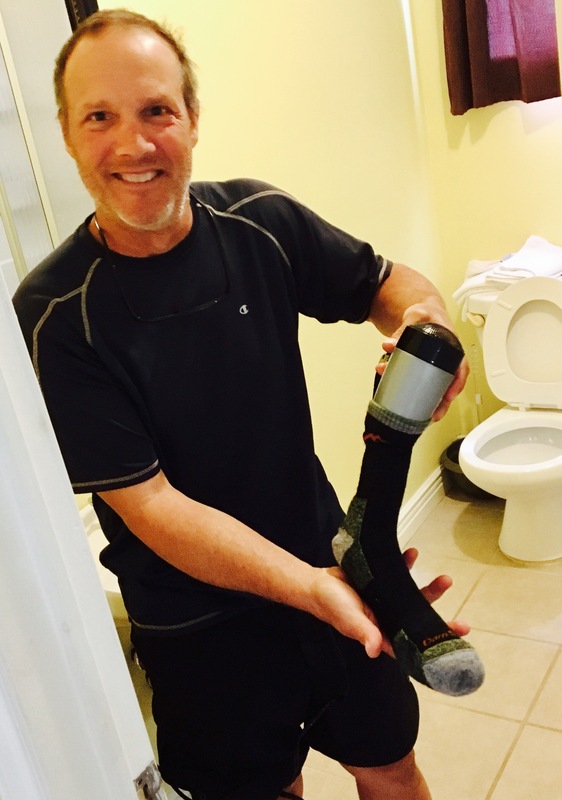 We started walking today at 10:15. it took that long for the heavy rain that fell during the night to taper off in the morning and our host Dave to drive us back to Aquaforte. After just 10 minutes we were completely drenched. Water from the rain clung to all of the foliage in front of us as we left the highway at Route 10. I used my trekking poles to whack the overhead branches in front of in order to throw the rain off before I brushed up against them. In addition to the rain on the foliage last night’s rainstorm topped off the levels of the copious black pools of muck that we slither and slide around multiple times an hour. Bad Influence was excited to stop to take drone footage through and around the massive stone arch at Berry Head. He had the great big sea as the backdrop for some spectacular video, complete with thunderous ocean soundtrack. 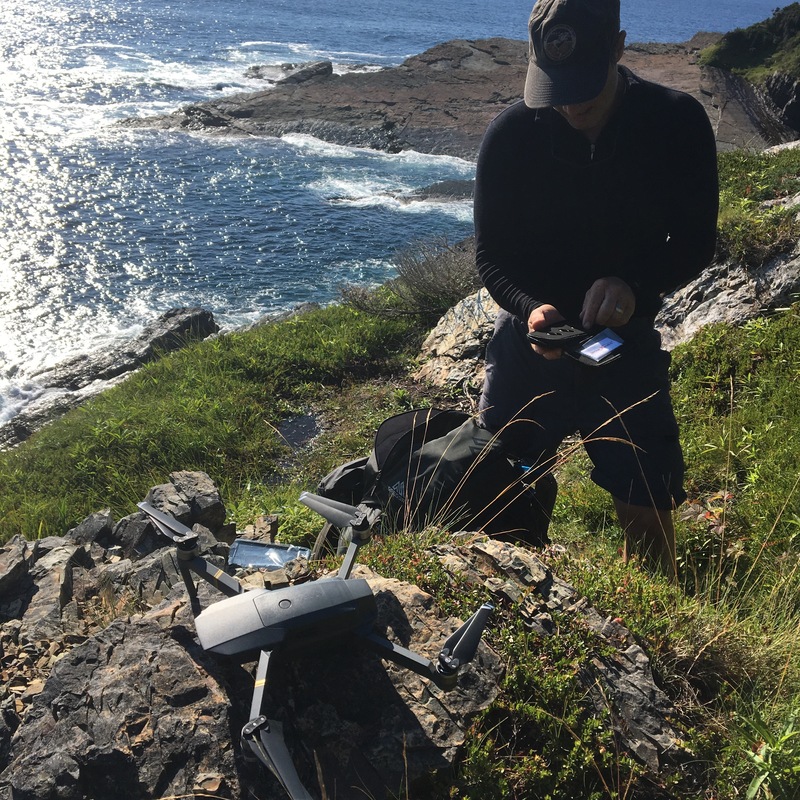 Just as he was filming the last portion at the arch the tiny Mavic Pro drone hit the wall and crashed into the deep. BI was lucky enough to have already transferred data from his previous drone recordings on to two SD cards. The portion of the footage around the arch was also preserved on the iPhone that served as the drone’s control and software module. 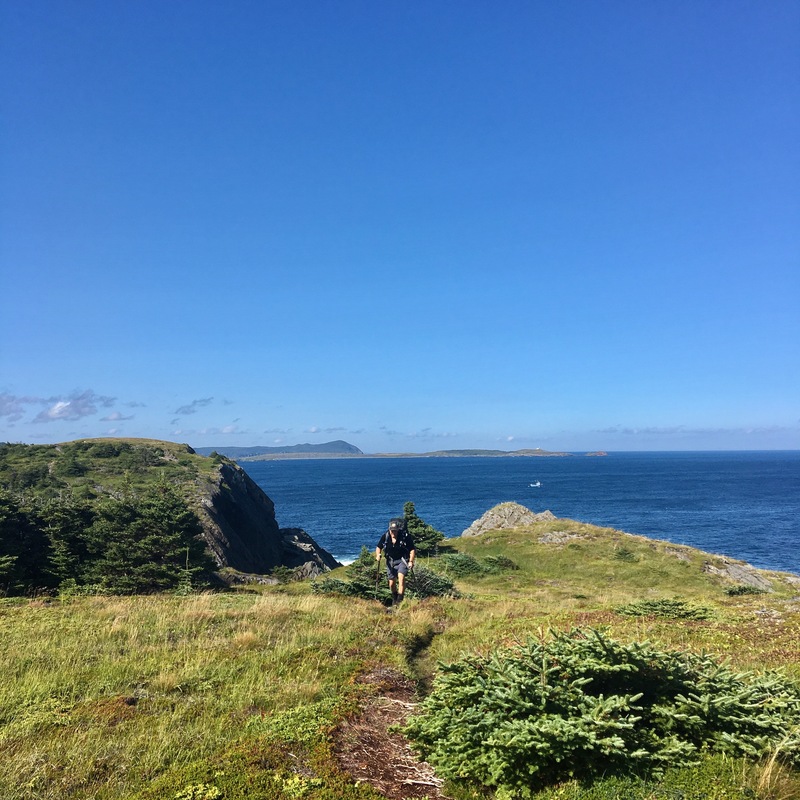 We continued to make good mileage and decent use of our time as we slogged through the wettest and muddiest section of the East Coast Trail so far. It was also section where the views were often obscured by the thick forest that flanked the ups, downs, and twist-arounds that characterized today’s track. 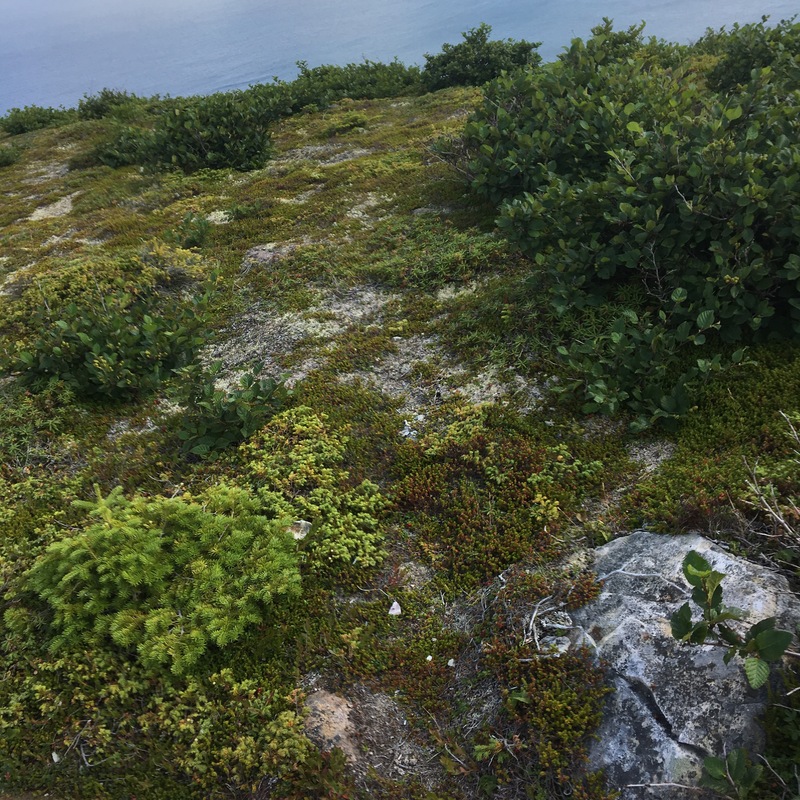 The section heading South from Fermuse interested me, due to the abandoned community that we experienced I was able to locate old foundations, piles of rock established by humans, and level areas at the edge scrubby forests that were important for sanity in the sloping terrain. There were numerous steep climbs today, as well as extended periods of walking through muck. 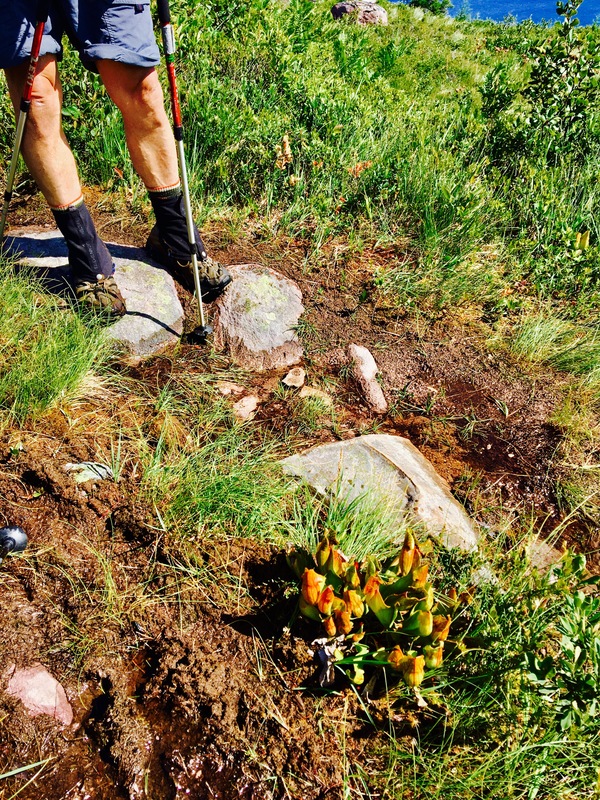 I gave up the thought of dry feet earlier, and unless the nature and depth of a nasty mud hole was ascertained, I would walk on the sides of the mud pool and lean my body away from the foliage with the support of my trekking poles. BI sunk in up to mid-calf twice today. Best to have him up front, eh? We walked late today. I didn’t want to and neither did BI. The issue was a lack of even one tent site that was level and not sopping wet. It went on and on. It was getting darker a bit. I was ready to stop, eat, and sleep in rapid fire execution. I loaded up 2 quarts of the brownish groundwater and expected to walk all the way to the Bear Cove Point lighthouse. BI liked the looks of a couple of trees just after the stream. He’s hanging in a hammock this trip, so he cares less about what’s on the ground under his comfy bedroll. I didn’t have a decent pick. 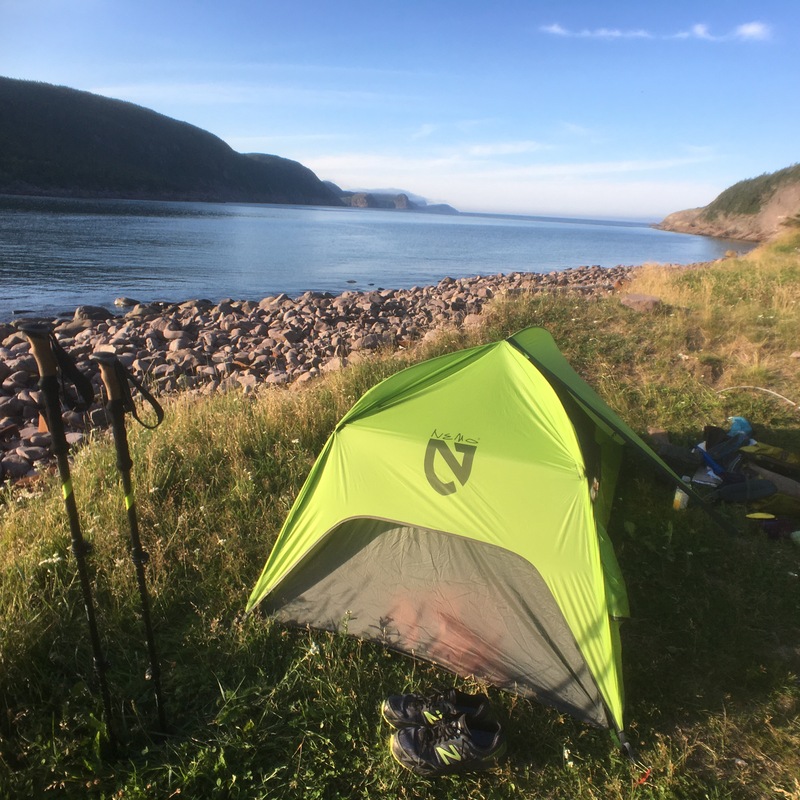 I ended up needing most of the East Coast Trail track in order to accommodate my tent’s footprint. The stars out tonight were astounding, as I was swatting away mosquitoes. 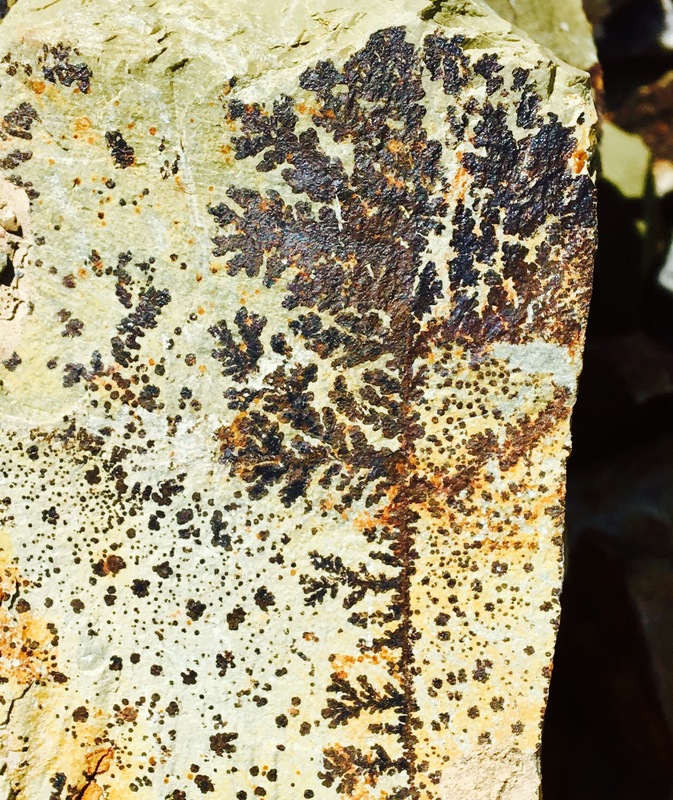 Here are some photos from this amazing day of hiking oceanside. We scored a breakfast at mid morning. At noon, we encountered a young German couple who told us that they spent last night tenting in the rain. They apparently didn’t realize that when it rains any descending ground turns into a watercourse. They reported adjusting for rain water flowing around and under their tent during the night. 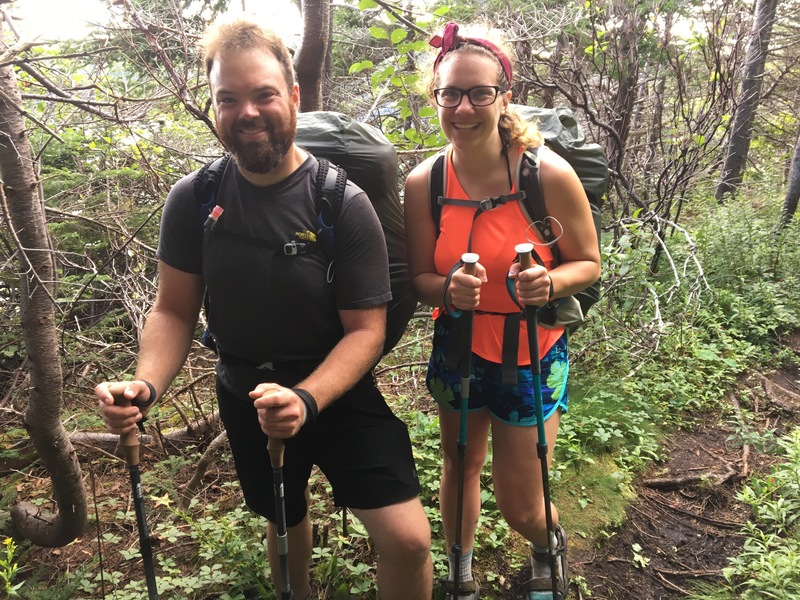 They had two weeks to hike from Cappayden to St. John’s. 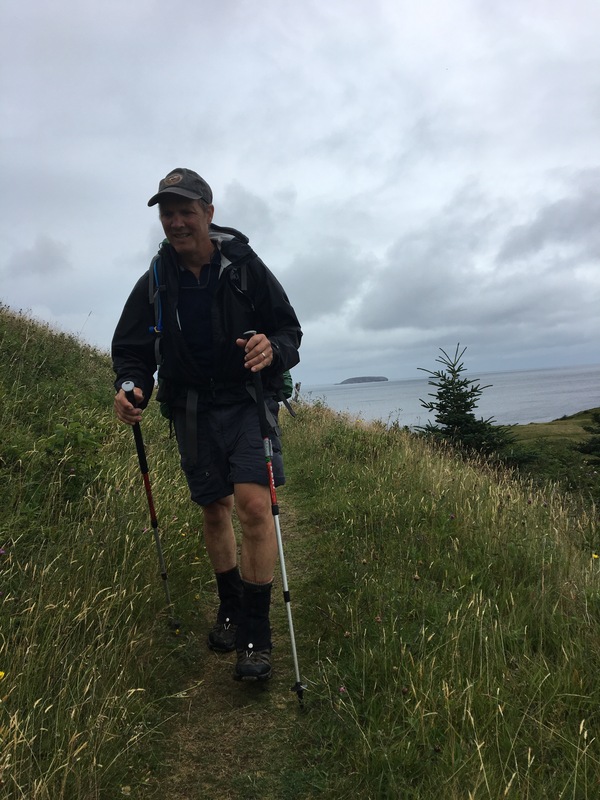 BI and I counseled them to consider hitching up past St. John’s to start with the two newest sections and work their way south. 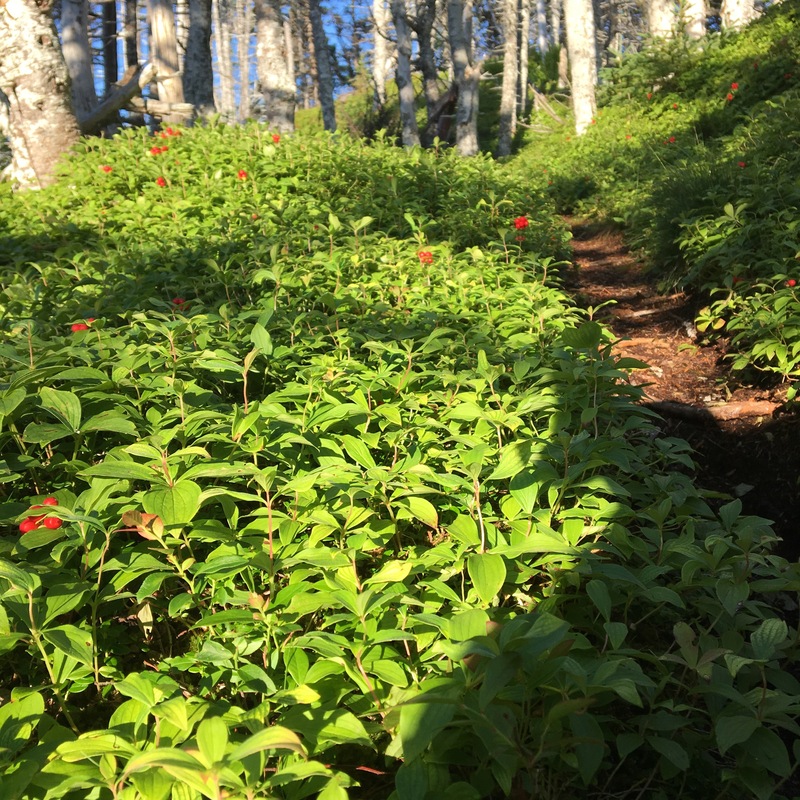 BI and I have been grumbling about the unkempt nature of the trail in this last quarter section and the numerous mud pits and bogs that we trudge through. BI and I did a little bit of “overland exploring” or better put as bushwhacking today. It was on map #13. 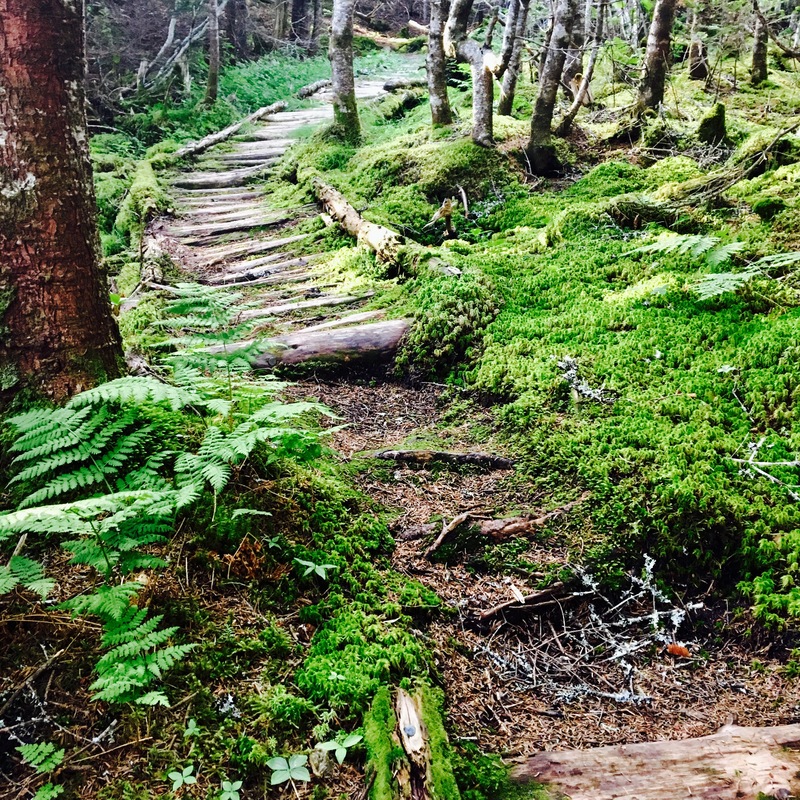 We’ve been seeing these green dashed access trails but have avoided them until today when we decided to explore an alternate route from Church Cove to Slaughters Pond. The intersection was signed, pointing to Calvert. 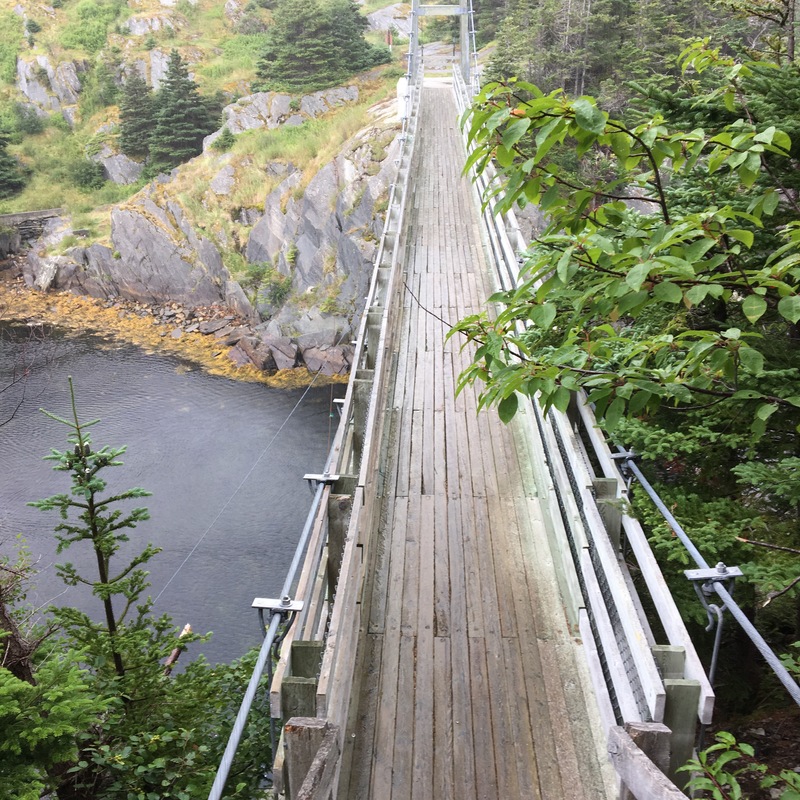 Things went fine until the trail petered out entering the Church Cove Marsh. We entered an area with multiple ATV tracks and quizzical routes in a huge marshy bog. BI got the idea to launch the drone as a reconnaissance tool and find us a way out. This is a pic of what it discerned. We found our way to a road in no time. 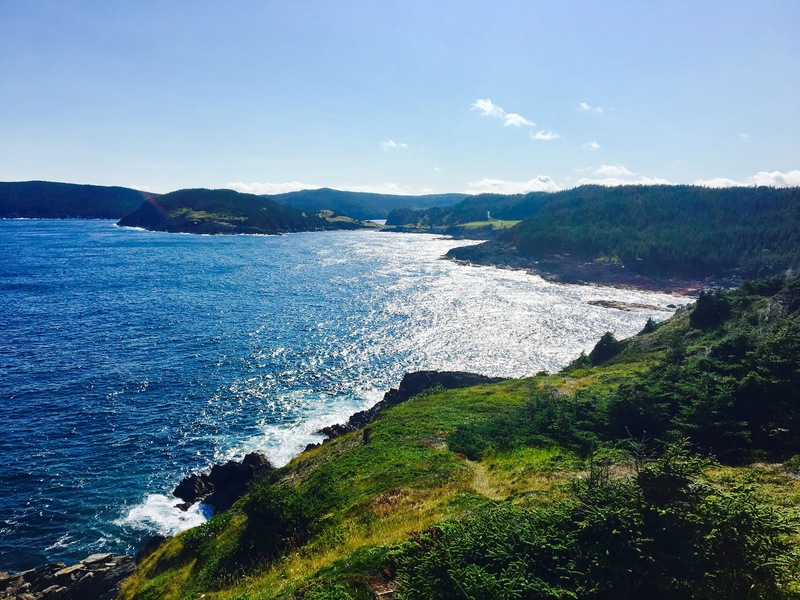 Newfoundland’s laws ensure that the edge of the landmass stays public property. A 10 meter strip of land that starts at the high water mark is legally open to the public for walking. 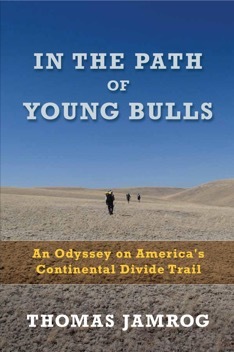 This trail has the potential to keep growing, both in popularity and in scope. It deserves greater consideration by US long distance backpacking enthusiasts. 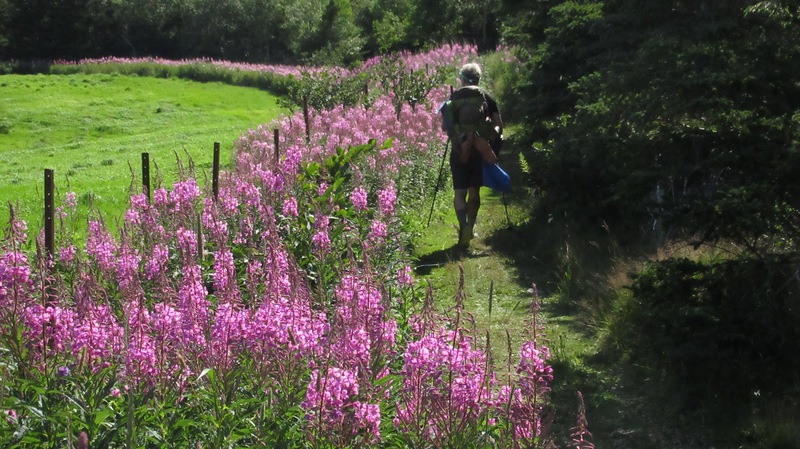 The closest I have come to experiencing a multiple day backpacking trip like this was backpacking the Fundy Footpath on New Brunswick. That experience was documented in this 4 part blog post from October in 2008, where Bad Influence and I teamed up with Rangoon and Zenon, who served as our host and guide. Our place that night was in a newly renovated home where the bottom floor had two brand new rooms, huge comfy beds, a TV with DVDs, but no WiFi. We were within a short walk of the excellent Squid Jigger restaurant, which did have great WiFi, which we used to catch up on correspondence and the plate of cod was fresh and tasty. 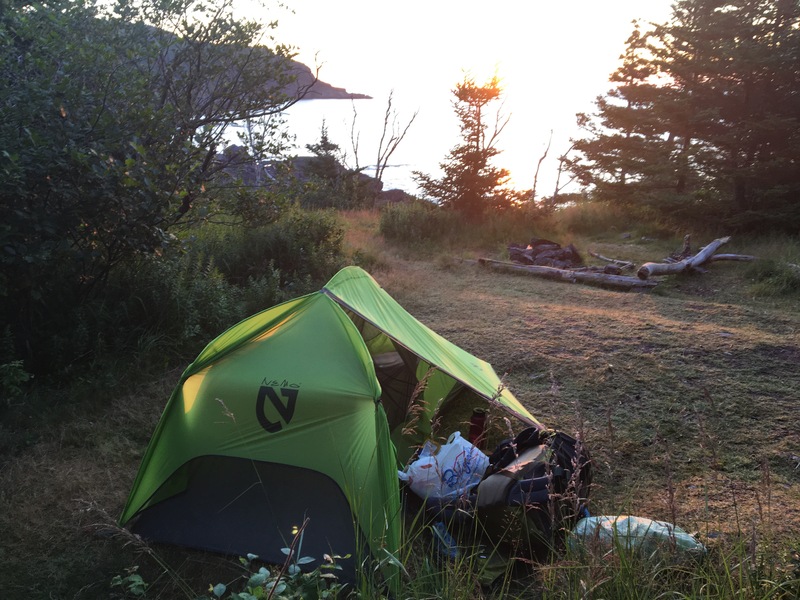 Roaring Cove Campsite to Long Will Campsite 38,900 steps via Fitbit. Dark and stormy skies opened the day. Today’s path was described by the map as “Difficult to strenuous” and the walking certainly reflected that. 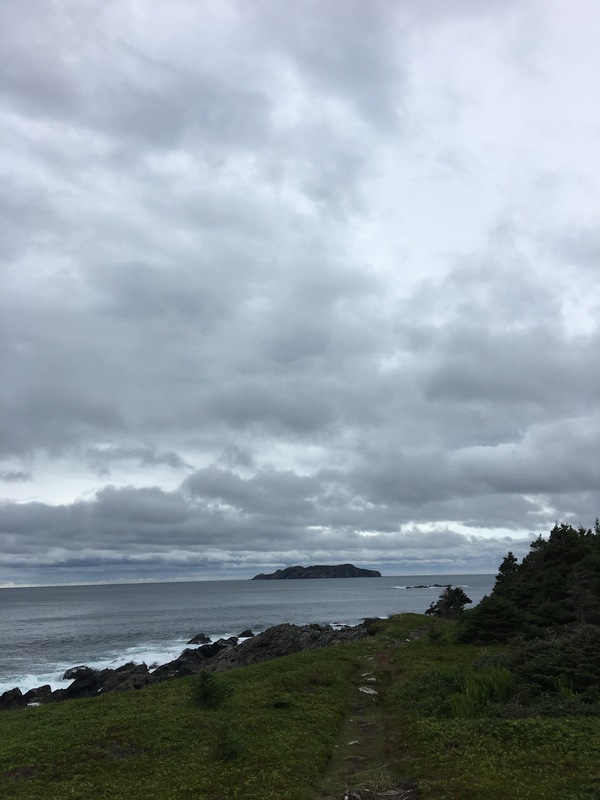 We made relatively good time from our campsite to the tiny first settlement of Brigus South which had nothing to offer us, even a roof to get under to get out of the light rain. On we went to Cape Broyle, where we had an excellent lunch at the Riverside Restaurant and Lounge. I had a bowl of seafood chowder, a chef salad, rolls, coffee and pie. I also ordered a club sandwich to go, with a bag of chips, which set me up for a special dinner. These ” community links” roads are sometimes long- this was was a road walk of over 3 miles, but after walking a third of it, we were picked up by a young fellow who was helping build a new house here. Hitching is easy now, folks around these parts recognize hikers. 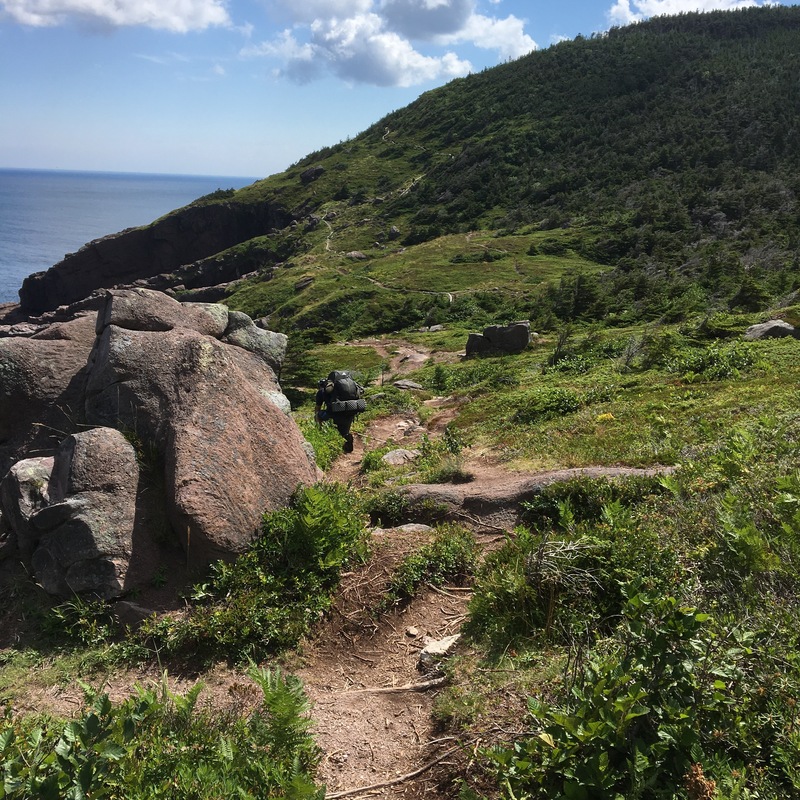 The path after Cape Broyle was hard, with relentless ups and downs as well as sections that were mini- quagmires of dark mud. Wet feet and socks went on all day again. You get used to it. They dry out later only to get put back into wetness after a couple of hours of walking, no matter how careful I am at dodging the muck pits. In every one of my longer thru hikes I eventually get to the day when it appears the end is near. That day was today. Pulling out the remaining maps, I have 7 left, Maps #13-19. Total walking mileage without community links is a mere 30, or 50 kilometers. We have 5 days left here before flying out of St. John’s on Aug. 25. We reserved a room at Wild Roses B & B for the night of the 24th so that we can take advantage of being shuttled to the airport. We also missed a section to Cape Spear that we want to fit in on Aug. 23. 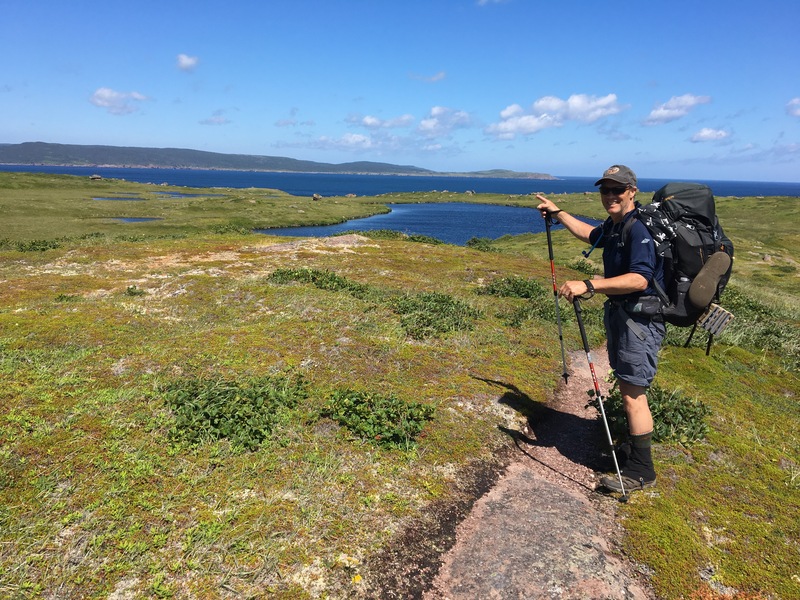 BI and I agreed to try and make the 30 Miles of hiking in 2 days, leaving us an extra day to either complete that, or use it as part of finishing the Cape Spear path. I really enjoy trying to meet these logistical challenges , but only if it’s not stressful and obviously working against the tide, which has not been the case up here so far. I’m set up on a tent platform tonight, with Bad Influence nested in his comfy hammock nearby. He has applied a down underquilt to beneath his hammock so his underside stays warm. That’s the one drawback to a hammock- unless you insulate the bottom, you get cold, even in summer. 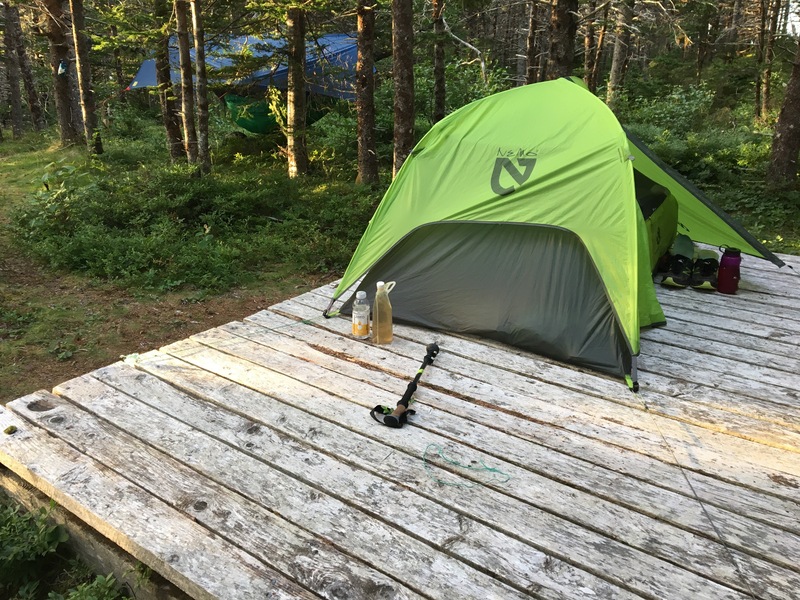 I’m disappointed in the performance of my Nemo Hornet 2 person tent. It’s constructed of too flimsy a fabric to stand up to the kind of use I put my gear through. It’s the only tent that I’ve torn the stuff sack while walking (I carry my tent on the outside of my backpack because it is often damp or downright drenched). Even worse, a couple of small tears have graced my tent fly as well, which are likely due to the tear in the stuff sack, which must have snagged on a protruding spruce branch today. Back to LL Bean. Not interested in replacing it. I look forward to a cozy night’s sleep under the protection of Nemo tonight. I want to be fair to Nemo. It is not his fault that he sports an ultralight outfit. But he’s headed back to the minor leagues. Phew! I appreciated Bad Influence’s grit for the last 90 minute of hiking today, which began at 7 am and ended at 5:30 pm. I was leading for most of the day but I started flagging at the end and he took over. We initially made great progress, with reaching 5 miles by 9 am and then 10 by noon. We took a break at a bakery in Burnt Cove where I had a cup of coffee, a fresh blueberry muffin and also a huge cinnamon roll. The woman that owned it and baked the goods told us she wants to sell. It’s in an astoundingly beautiful oceanfront location overlooking the highly interesting Ship Island. BI and I talked about how perfect it would be to open a hiker hostel there but I expect that the real estate alone would be very expensive, even in these tiny villages by the sea. Whales were everywhere again today but it was very windy, with gusts up to 25 mph. It also rained from about 10 am until 4, which made the trail muddy, slippery and saturated out socks and footwear once again. It was a long hard day. It also didn’t help that we wasted almost two miles taking the wrong trail after walking off the suspension bridge in LaManche. A most unique encounter occurred today. It happened in the last hour of the day when we met a young couple walking up the trail toward us. 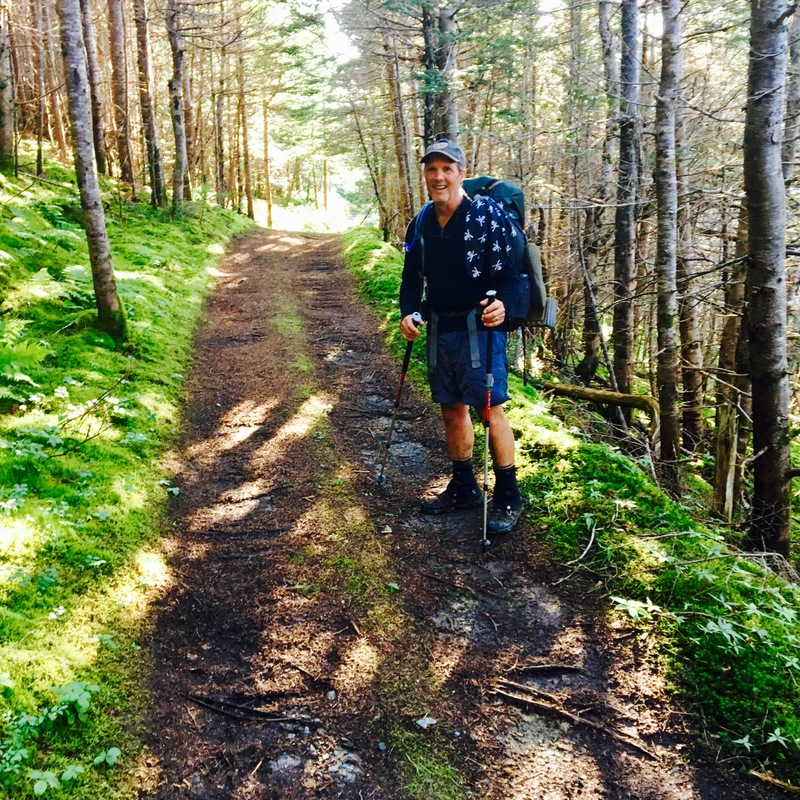 They looked at me and asked, “Are you from Maine?” Then, “You’re Uncle Tom, right?” Then I recognized Bret and Magic, two backpackers that I had helped in The Hundred Mile Wilderness last September when I was guiding a client through there. I met them at the Rainbow Stream shelter when they discovered that they were low on food. I always carry extra meals and gave them food. They remembered that I was talking up the East Coast Trail even then. It certainly is a small world, this long distance backpacking community. What are the chances? BI and I disturbed a nesting eagle by walking past it’s property this morning. It made a ruckus and the started flitting over the trail when I hightailed it out of there. 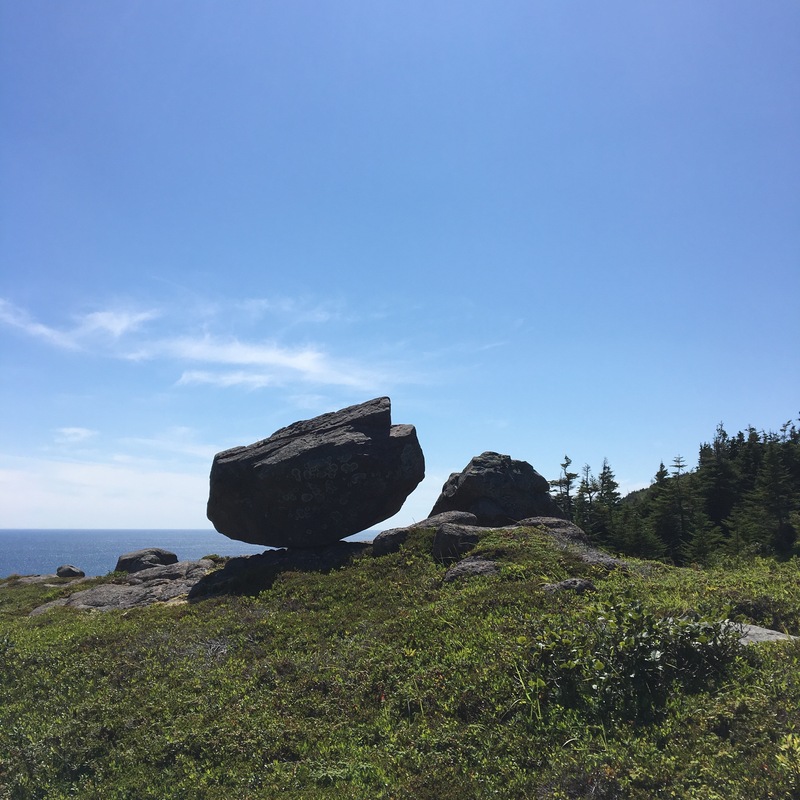 I know that hikers have been dive bombed by pissed off hawks and a huge freaking eagle would do serious damage to one’s head if it hit you with its claws or beak. There is a couple here from Holland hiking for only 2 days out of their 1 month Canadian vacation. They are so impressed with this trail that they plan to hike it all next summer. Bad Influence’s turned ankle is getting better. He had a habit of really pushing when he is hiking in front. He says he can’t help it. I can’t keep up with him. 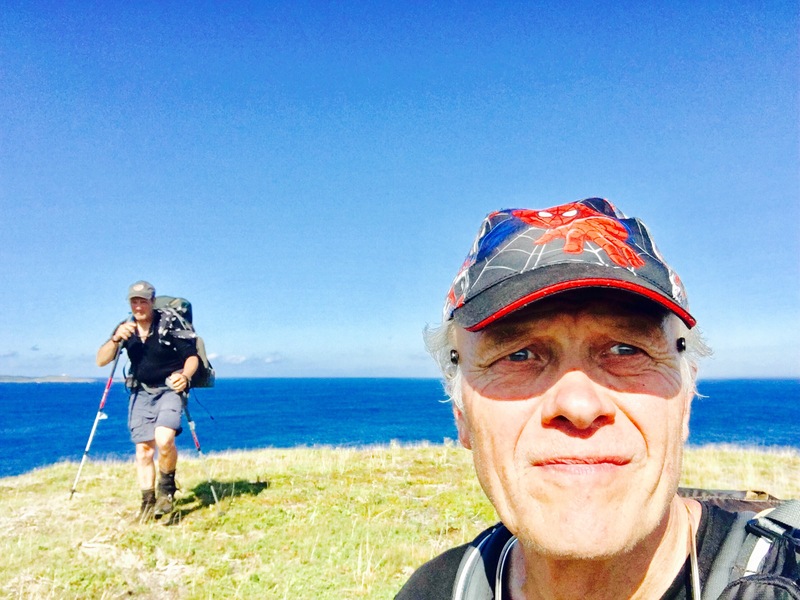 Tomorrow we will reach Cape Broyle, where I need to purchase 2 more days of food. It will have to work out at the Ultramar convenience store, because that’s it. Today’s walk is accurately rated as easy to moderate in difficulty, with an estimated 2 to 4 hours of traveling. 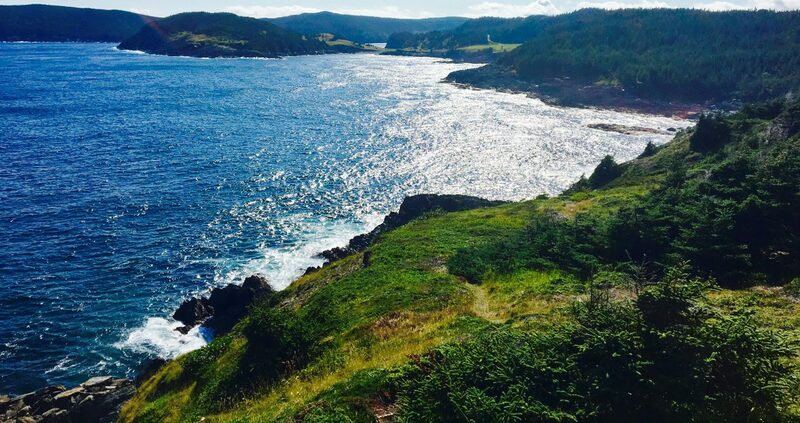 This section includes woods walking, tramping across sea meadows, and taking in cliff edge views of the Witless Bay Seabird Ecological Reserve opposite Burnt Cove and the rugged coastline to the south, where we are headed. We see and even hear the blowing spouts of giant whales all day long. Two heavily loaded whale watching/ seabird nesting tour boats passed us motoring their way over to a group of a dozen humpback whales who have been feeding on a jut of land south of us for close to a month now. Newfoundland and Labrador has the largest population of feeding Humpbacks in the world. Humpbacks spend the winter months in the Caribbean and migrate north to the Newfoundland and Labrador coast during April and stay until October. It rained last night and all morning. Bad Influence and I made the right choice by taking the day off to wash clothes, eat real food, make plans for the challenges ahead, and catch up with editing photos and our communicating with our friends and families. 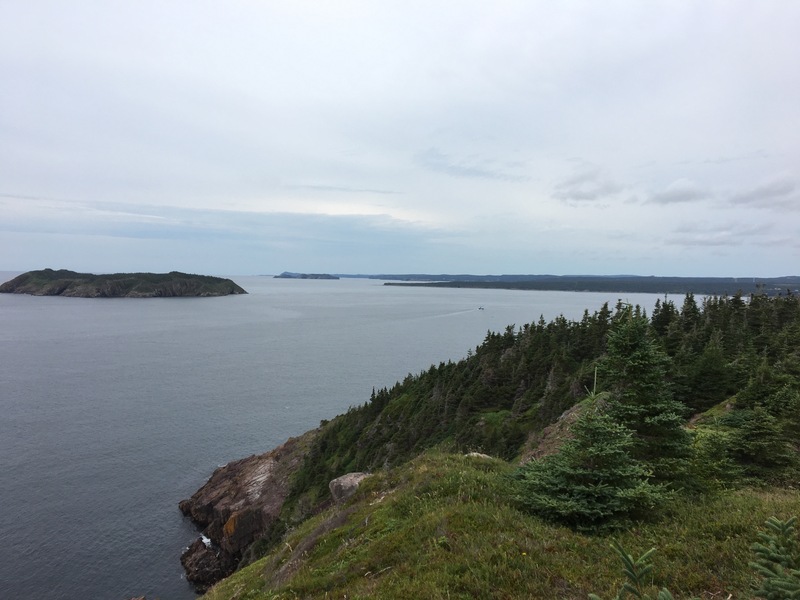 Today I have been thinking about previous trips that I’ve made to both Newfoundland and Labrador. I used to take motorcycle camping trips up here to explore various “ends of the road”. My Newfoundland/ Labrador interest started back in 1993 after my friend Alan MacKinnon and I read the book Great Heart, by Rugge and Davidson. In 1993 Alan and I were among the first motorcyclists to ride the 200 miles of rough gravel road that went from Churchhill Falls to Happy Valley/ Goosebay. After reaching Goosebay we rode further east to the tiny village of Northwest River, where the protagonists of Great Heart departed for their own ill-fated destinations. 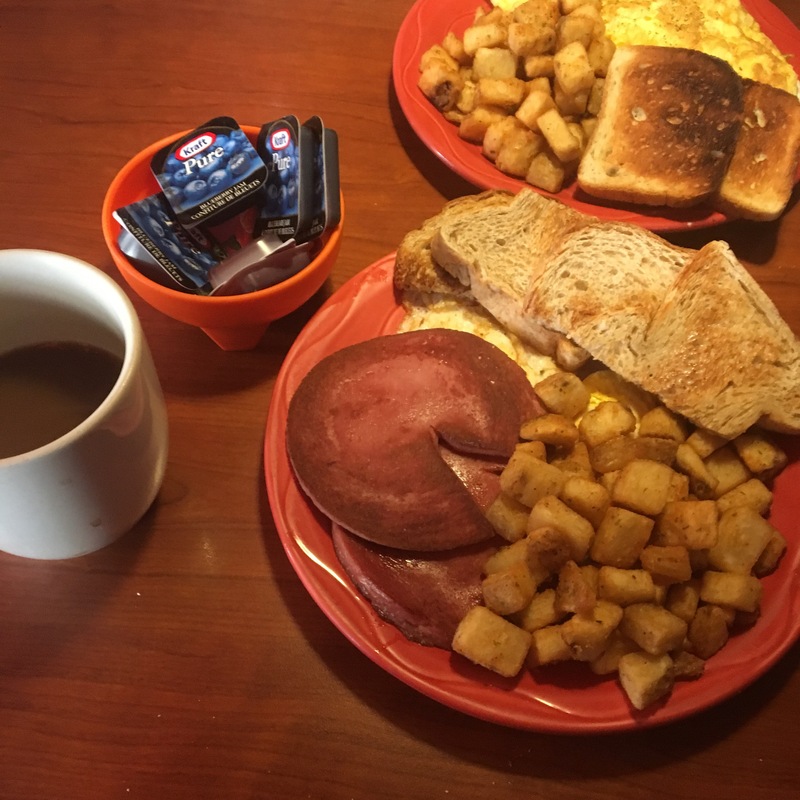 Sitting for breakfast at Robin’s coffee shop yesterday in Bay Bulls I struck up a conversation with a man who told me that he had once lived in Northwest River for two years with a girlfriend, doing nothing much but hanging out fishing and hunting. In fact he had lived next-door to the Blake family. I am not giving too much away to say that Burt Blake was one of the young Labrador trappers who saved Dillon Wallace’s life after Wallace attempted to rescue his ill-fated partner Leonidas Hubbard. 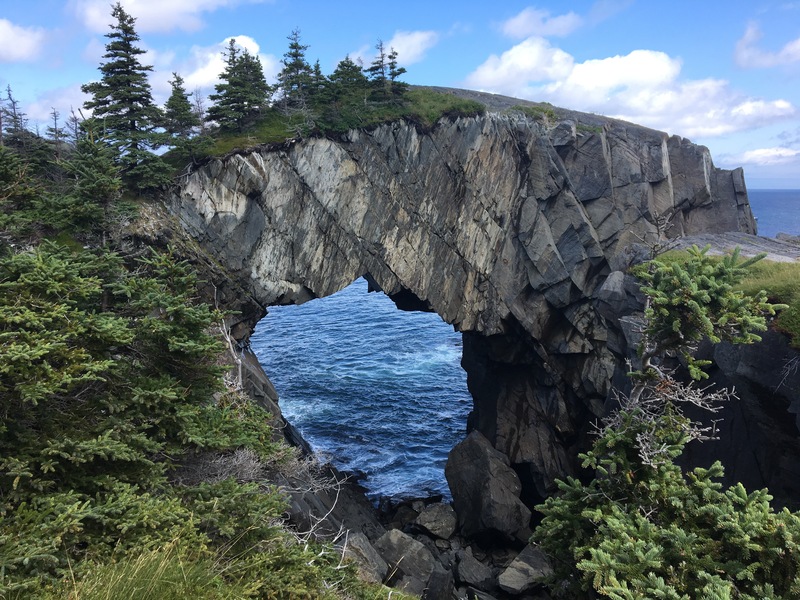 Some thoughts about the East Coast Trail after one week of traveling. First of all, this 310 k Trail definitely lives up to its description as a “genuine wilderness walking and hiking experience”. 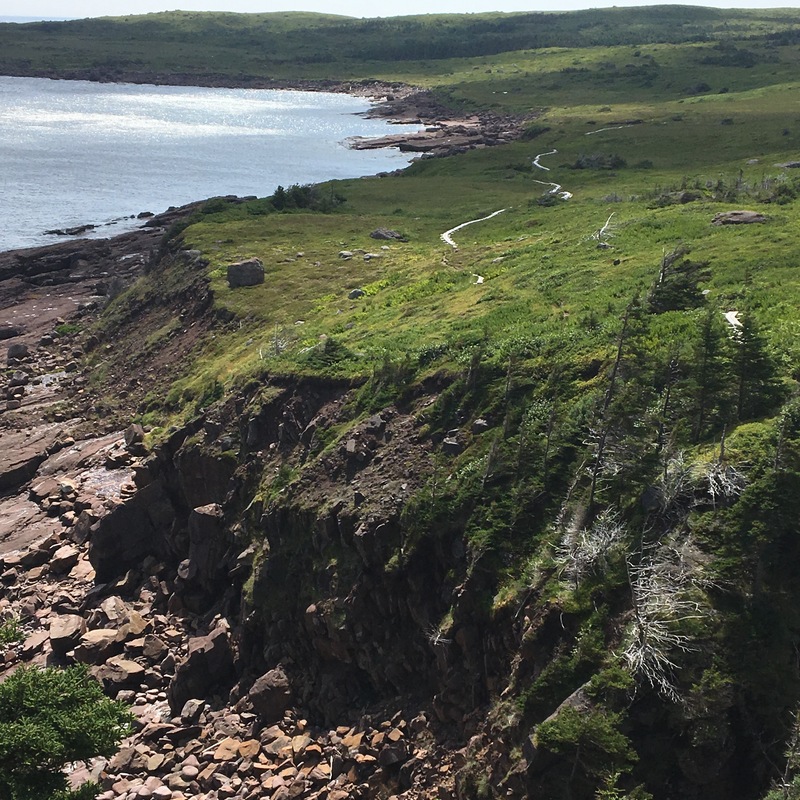 Printed materials from the East Coast Trail Association describes the trail as passing directly over the most easterly point in North America at Cape Spear as it connects over 30 communities along the route. The hiking is not easy. 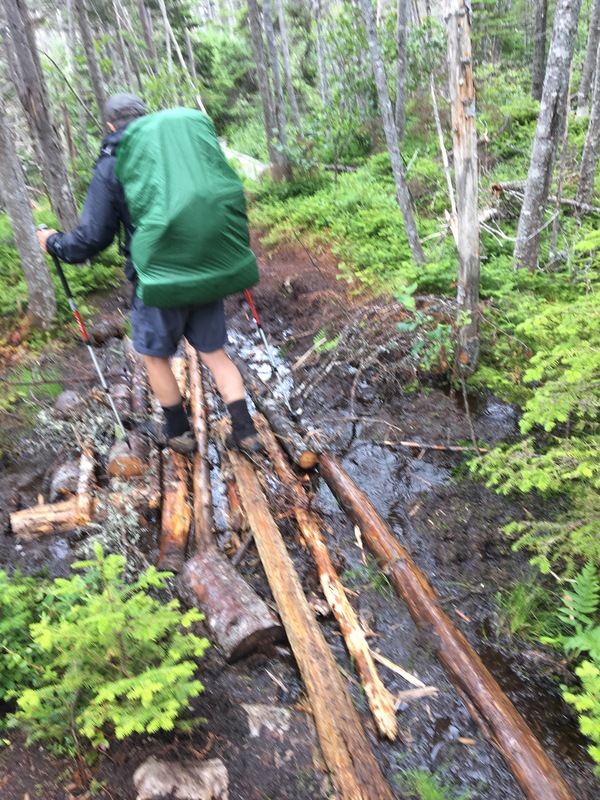 Parts of the trail are wet and numerous planks, wooden bridges and walkways assist the hiker in some of the more challenging sections. Distances that I am recording appear to be approximately 15% greater than those stated in the printed maps. Also the issue of “community paths” which are segments that passed through the actual communities linking individual trails between settlements and towns. The sections are not accounted for on the individual maps probably due to the fact the trail was not set up for thu-hiking. Sometimes we have walked those full sections. 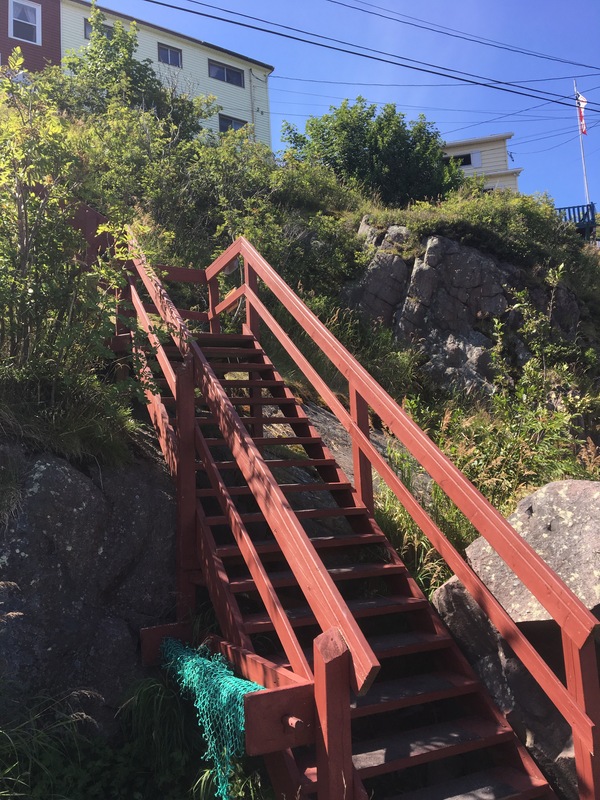 For example, we walked completely around St. John’s Harbor from Quidi Vidi to Fort Amherst, but that mileage isn’t listed or counted on the official map. Folks walking sections also have to add the trailhead mileages from highways as well, so many hikers need to be aware that their own walking will be longer than indicated on the map mileages for segments and budget extra time. I really enjoy visiting the communities along the way where people are very friendly, interested in where we are from and what we are doing. This isn’t a great deal for vegetarians or gluten-free dieters. We have eaten potatoes, carrots, and turnips ‘a plenty so far. 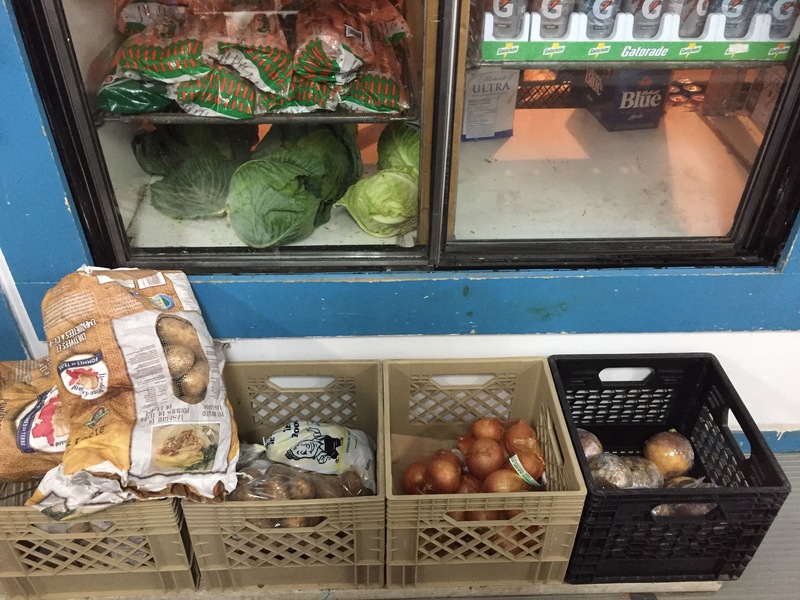 There are adequate choices for resupply at small convenience stores, it you might have to get creative. Bad Influence and I are carrying the perfect backpacking stoves for this trip: Four Dog Stove Bushcooker LT1 multifuel units. We are able to burn wood, denatured alcohol, or solid fuel tablets. Don’t count on finding the smaller isobutane canisters in the small villages. We bought a quart of the alcohol at a hardware stove, but have been able to cook most nights using dry wood. I have used a squirt of hand sanitizer on top of the wood in my stove to ignite it. A couple of nights ago igniting a Frito corn chip got the wood fuel going. We are only boiling pints for water to rehydrate our meals so aren’t using much alcohol at all. I am also carrying an backpacking umbrella, which has come I handy for rain and also for shading he strong clear sun that is parching in the afternoon. 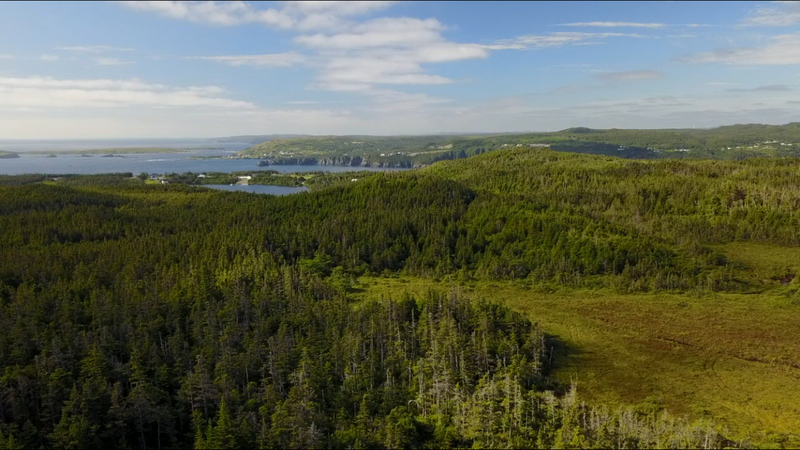 I’m looking forward to an easy start out of Witless Bay tomorrow. I can pack up tonight and be ready to go by 7 am, with no tent, sleeping pad, or sleeping bag to deal with in the morning. I love a town stop and roof over my head when it is raining. A true Newfoundland breakfast was prepared for us by Mary at 8 this morning at Wild Roses B & B. In addition to the ever delicious lassi tutons, a 1/3 pound slab of crispy black sausage graced my plate of toast and eggs. Bad Influence asked Mary what it was and she first tried, ” You don’t want to know” on him. He persisted, and was met with a, “Don’t ask.” Polish sausage of this same nature is called kishka (blood sausage). My band, King Pirogi, performs the classic Polish drinking song, ” Who Stole the Keeshka” and I’m thrilled to finally eat a sample. We had a late start of 10:45 today after hitting the grocery store for a couple more days of resupply ( I’m now carrying three days worth of meals) and finally changing US dollars into Canadian money at 74%. $100 US nets $126 Canadian. World class hiking returned today on this stretch, which was characterized by more rolling ups and downs over boggy peat flanked by heather that was waist high on the slopes. Trees were scarce until the end of the day. Wet feet were inevitable, with copious pools of water standing in the trail after last night’s rain. I find myself enjoying wet feet here. I’m sporting new footwear ( New Balance Leadvilles) after a 10 year run of New Balance military desert boots and I’m quelling a blister on the tip of one of my toes. The cool wet helps. 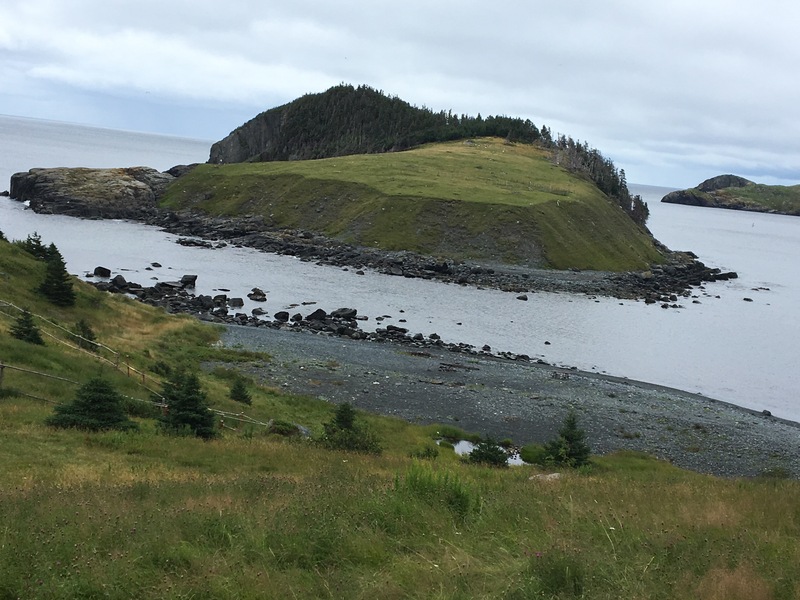 Just before we found our campsite, we came upon vestiges of civilization at the junction of the Pipeline Road at Shoal Bay, where there was once a year round fishing settlement, a copper mine, and the former sewer line from Goulds. Tonight, we scored a primo tent site on a flat grassy rise, complete with a pit toilet for our morning enjoyment. There are 2,500 humpback whales around Newfoundland right now moving north. We see and hear them surfacing all day long. Day 5 Eastern Trail : Retreat! Daybreak bailout. The rain that began at midnight was now driving against the tent. 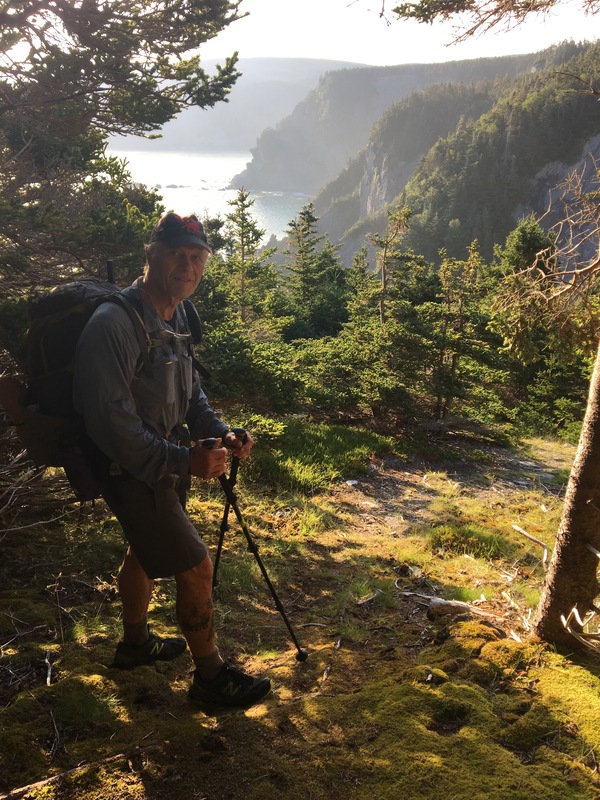 The locals who were camped above us slid down the hillside and one of them advised me to follow their lead and head back out, hit the highway south, and hitch to Petty Harbor rather than hike the trail 12 more miles in pounding rain to get there. This confirmed my concern to keep moving in case of rain. The map guide for the section ahead counsels that if conditions are windy or slippery then it’s best hike the road. Furthermore, heavy rain floods the trail ahead at Staffordside and raises stream levels at Killickstone Cove. So out we went. It was less than 2 miles from our campsite to the highway. 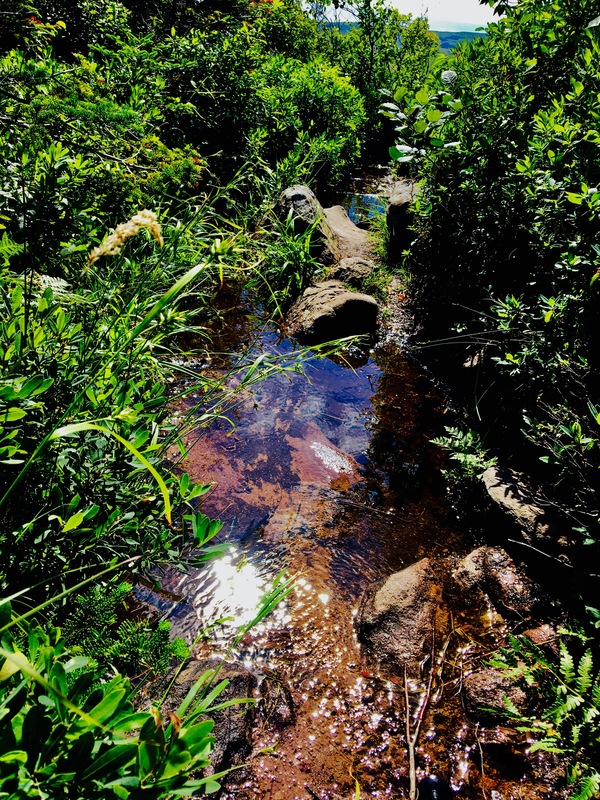 There was so much water flowing in the trail I gave up trying to avoid it and walked through whatever pools presented themselves. My tent and tent fly are completely saturated and have to be dried out. That will be impossible with wet weather all around us. After a dozen cars splashed past us a new Mercedes pulled over and a young couple drove us to the Coffee Shop in Petty Harbor where they worked. With no motels here a cursory check on the internet informed me that there wasn’t a room to be had, so we called Mary and she had room avaivlable at Wild Roses B&B and picked us up in 10 minutes. Sometimes it is necessary to retreat in order to move on. Easy day. We woke and walked down to have a decent breakfast at the Bagel Cafe. 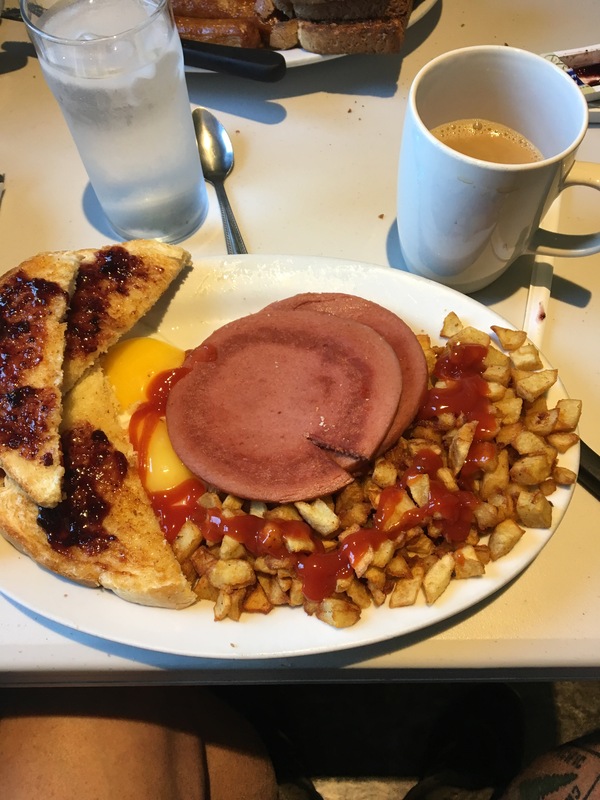 Huge cups of rich coffee and a big breakfast of fried bologna, eggs, home fries and toast did the trick. Then it was back to the hostel to pack up silently and slip away without awakening our room mates, Karen and Maxie. A $9 taxi ride ( Jiffy taxi) brought us back a couple of miles to where we fatigued out last night at the Quidi Vidi Brewery. From there, it was urban road walking through Signal Hill and along the road that hugged the harbor. We stopped for coffee at a Starbucks and took a break. Approaching Fort Amherst near the entrance to the harbor, we met a local woman out for a walk who gave us a rock with a fossil in it. She didn’t understand why I wouldn’t pack it up and carry it home. Then came a very sunny and hot walk, where I unfurled my trusty umbrella, creating a shade circle I could use to keep myself from getting overheated. We ended the day early, as we agreed to do. 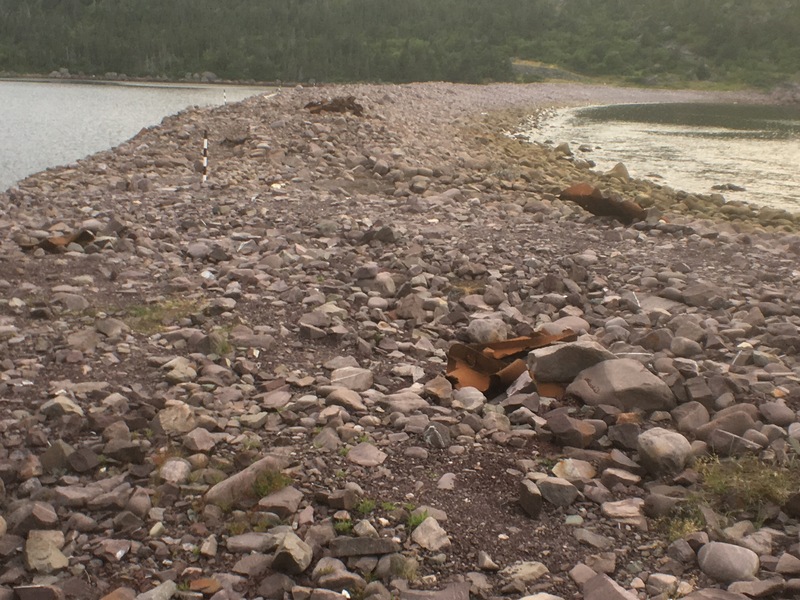 There is a massive barachois of rocks separating the Freshwater Pond from the sea. Upon arriving at Gut Freshwater Pond both of us dove in the fresh water side for a invigorating and cleansing swim. Lots of folks came and went as we settled into our campsite. It’s Saturday, and the locals are recreating as well. There is room enough for all of us here, for sure. 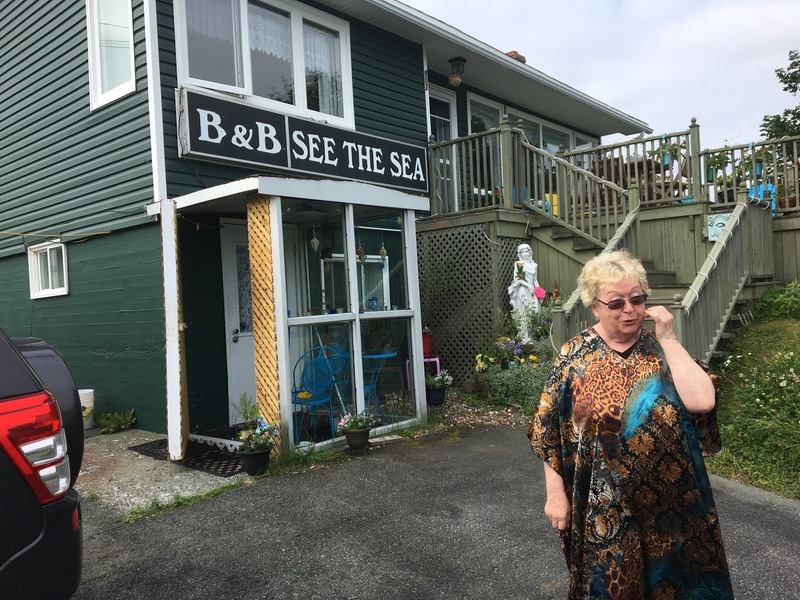 Sandra was a great host, and her Sea the Sea B & B was a deal for $98 for two. Today was a day when we ended up walking longer miles than we planned but still didn’t make it to St. John’s, falling short by a couple of miles. We did see whales surfacing through the hike -maybe as many as ten. They are feeding on schools of capelin and also squid. We are close enough to hear loud exhalations of co2 through their blow holes on the top of their heads. Their spouts are easily seen, even when they are hundreds of feet away. Binoculars would be good here. BI tried to move shoot video of the whales but we could not make it happen due to glare off the water. We met a couple of surveyors working along the trail who described the trail ahead of us as punctuated with numerous ups and downs today. True. Much elevations gains, even thought the trail generally ran along the edge of the land mass some 400 to 500 feet about sea level. It was hot, and parchingly dry, especially when hiking in full sunlight, unmoderated by tree shade. Still, there is so much water draining off the wet terrain that I still haven’t had to carry more than a quart. Hiking here reminds me of hiking in the west. In general, there are long views of what’s ahead and behind, and not the usual green tunnel of foliage that I’m used to in New England. There are zero deciduous trees. The harsh northern climate extends the alpine zone this far south. Much of the walking today reminded me of the highest zones of New Hampshire’s White Mountains. 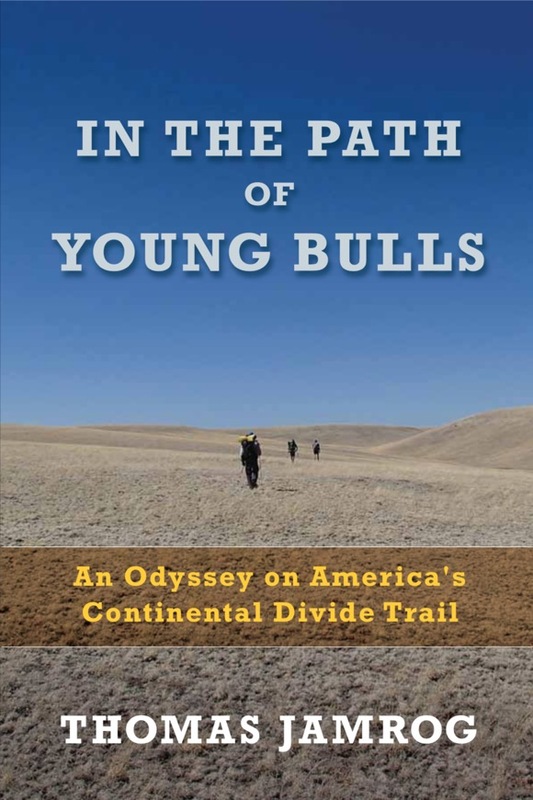 This could be a post about the ” good, bad, and ugly”- the quality information we are given about the trail. Sometimes it comes at you straight, when you most need it, like the homeowner who came out of his house this morning to point to the right fork in the road. Other times it is downright bogus. One fellow stopped to talk to us near Tableland. He had once lived there. We asked about water ahead and he said there was none and that we should go back to Tableland to get some. Nope. Heading south we crossed two good flowing streams within the first mile. Another time, we asked a young couple for directions and was told the trail continued past a viewpoint and it was it true. maps.me on my phone saved our asses numerous times today when the trail was lost. It’s a great app, free, and works on the trail without a cell connection. It detected the trail no matter where we walked. We only made it couple of miles short of St. John’s tonight. 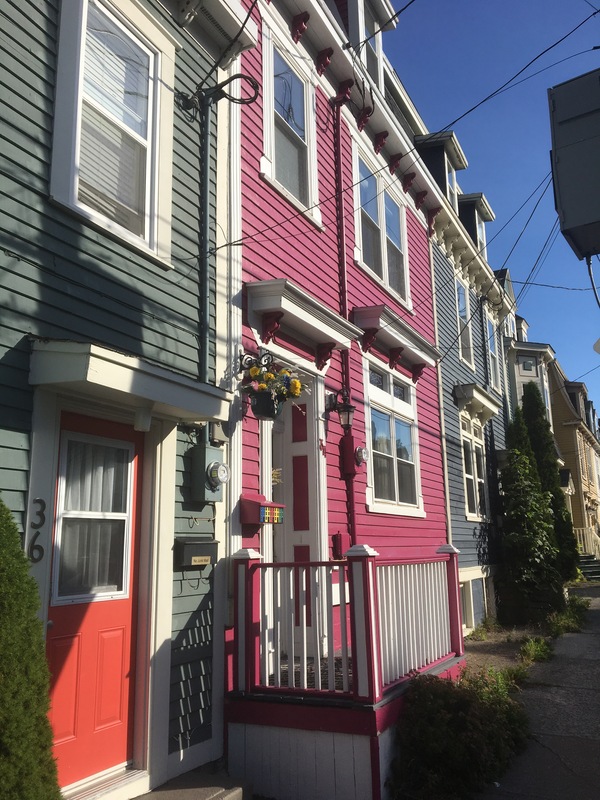 St. John’s has the oldest street in North America and is also the oldest city in North America. We had a couple of beers at the very crowed and hot Quidi Vidi Brewery when we called a cab to take us into the St. John’s Hostel where we scored a couple beds in a ” community room” which we shared with two young twenty-something girls on a summer road trip.